Bago (formerly spelt Pegu; Burmese: ပဲခူးမြို့; MLCTS: pai: khu: mrui., [bəɡó mjo̰]; Mon: ဗဂေါ, [həkɜ̀]; Thai: พะโค, rtgs: Pha-kho), formerly known as Hanthawaddy (Burmese: ဟံသာဝတီ ; Mon: ဟံသာဝတဳ Hongsawatoi; Thai: หงสาวดี, rtgs: Hongsawadi; Pali: Haṃsāvatī; meaning "She Who Has Swans"), is a city and the capital of the Bago Region in Burma. 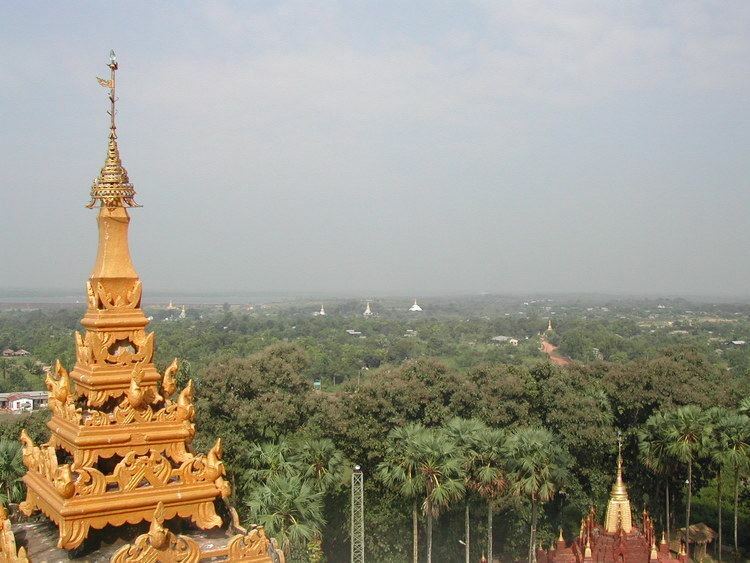 It is located 50 miles (80 km) north-east of Yangon. The Gulf of Martaban was colonized by Mon people from the Thaton Kingdom, who established Bago. In 825, the twin brothers Samala and Vimala founded Pegu. From 1353–1539, Binnya U, descendant of the Thai chief Wareru, established Hanthawaddy as the capital of the Mon Hanthawaddy Kingdom, which covered all of what is now Lower Burma. The area came under Burman control again in 1539, when it was annexed by King Tabinshwehti of the Taungoo Dynasty. The kings of Taungoo made Bago their royal capital from 1539–1599 and again in 1613–1635, and used it as a base for repeated invasions of the Ayutthaya Kingdom. The capital was looted by the viceroy of Toungoo, Minye Thihathu II of Toungoo, and then burned by the viceroy of Arakin during the Burmese–Siamese War (1594–1605). Anaukpetlun wanted to rebuild Hongsawadi, which had been deserted since Nanda Bayin had abandoned it. He was only able to build a temporary palace, however.